Hidden, secret or just plain unexpected, Joburg is full of surprises and there’s lots of fun to be had in seeking out places that even most locals may not have heard about. The financial capital of South Africa, Joburg is home to the headquarters of all of the country’s leading banks and the pursuit of wealth certainly keeps this city more than busy. To learn about the history of all things money, visit the ABSA Money Museum hidden inside the sparkling halls of one of the Barclays Bank skyscrapers in the city centre. To glimpse the city’s gold rush origins, pay a visit to the downtown headquarters of Standard Bank. Beneath the building is Ferreira Mine Stope, a long forgotten mine entrance that was rediscovered during the 1980s and has been preserved as a museum site. There’s a small exhibition of old photographs, early prospecting maps and old-fashioned mining gear illustrating how Joburg’s gold rush began. An unusual downtown bar with a less than obvious entrance is The Vault, part of the Faircity Mapungubwe Hotel. The bar is housed in the hotel’s basement in what was once the vault (complete with the original brass and copper safety deposit boxes) of the French Bank. ​Also part of a former bank is The Brass Bar on 85, located inside the City Central building. Built in the early 1940s by leading architect Gordon Leith for Barclays Bank, the building is an interesting example of the early-modernist style with a towering triple-volume marble banking hall, above which hangs a giant brass-and-glass chandelier. 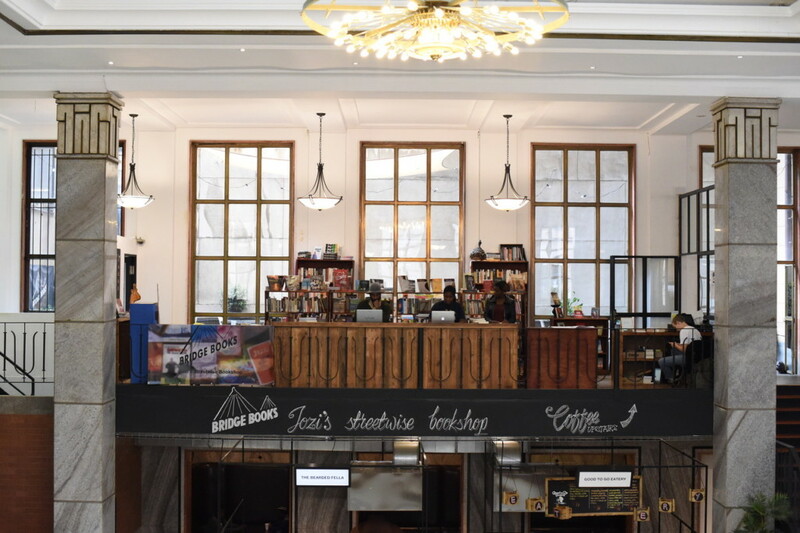 In the centre of the banking hall is a weekday food hall, while upstairs on the mezzanine level you’ll find Bridge Books book shop next to The Brass Bar on 85. We are not quite sure what came first, the thirsty miners who flocked here before the city was even proclaimed in search of gold or the bars, but we do know South Africa has a long tradition of ‘secret’ pop-up bars that includes the illegal ‘shebeens’ that cropped up in township backyards and living rooms in order to circumvent apartheid’s restrictions on township drinking. Following the advent of democracy most shebeens went mainstream and become fully-fledged bars and pubs. However, as in any great city, Joburg will always have its fair share of hidden nightlife hotspots that most visitors wouldn’t normally find without a little help. Here are some of our favourites. In Rosebank, hidden inside the back of the Coalition pizzeria, is Sin & Taxes, a ‘speakeasy’ run by expert mixologist Julian Short. The dimly-lit one-room bar specialises in cocktails and there’s a new themed menu each season. Given its tiny proportions, the bar fills up very quickly. If the brass wall which conceals the entrance doesn’t open for you, take that as an indication that the bar is full. 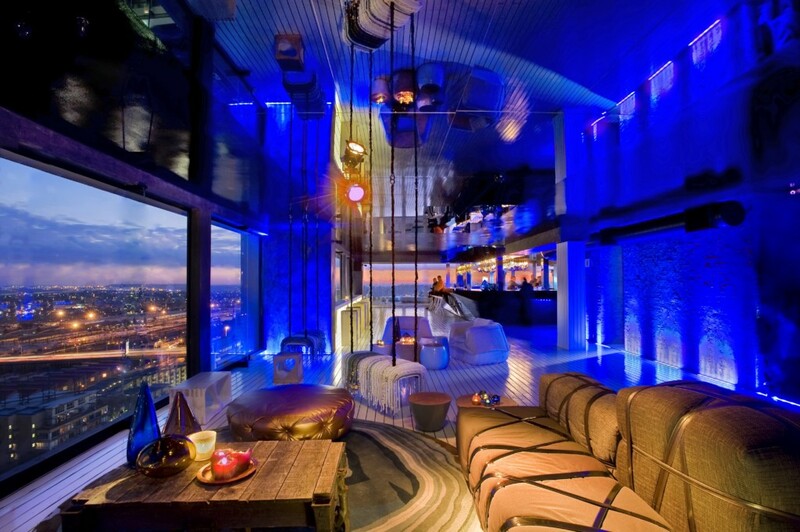 Closer to the city Randlords, a glamorous rooftop club perched 22 floors above the student district of Braamfontein, offers up some of the most memorable cityscape views. Randlords only opens for special club nights and occasional rooftop concerts so keep an eye on its Facebook page for any upcoming events. Across town in Maboneng, off the beaten track, is The AGOG, a building which houses the contemporary art gallery AGOG, The Nine Barrels wine bar, and has a small and exclusive whisky bar on its roomy rooftop called The Q Club. Drop by on Sundays for the sundowners session. A few blocks over on Auret Street look out for the Rooftop Salsa party every Sunday which takes place on a purpose-built space on the roof of a residential building (28 Auret St, tel. +27 76 562 7298, facebook.com/RooftopSalsa, from 15:00-19:00, entrance costs R50). At Melville’s Hell’s Kitchen where they serve up their patented ‘Hellfire” cinnamon whisky surrounded by posters of rock’s bad boys and a neon sign imploring you to “Be naked when I get home” , a secret room awaits. If we told you to how to find the entrance that would spoil the fun. 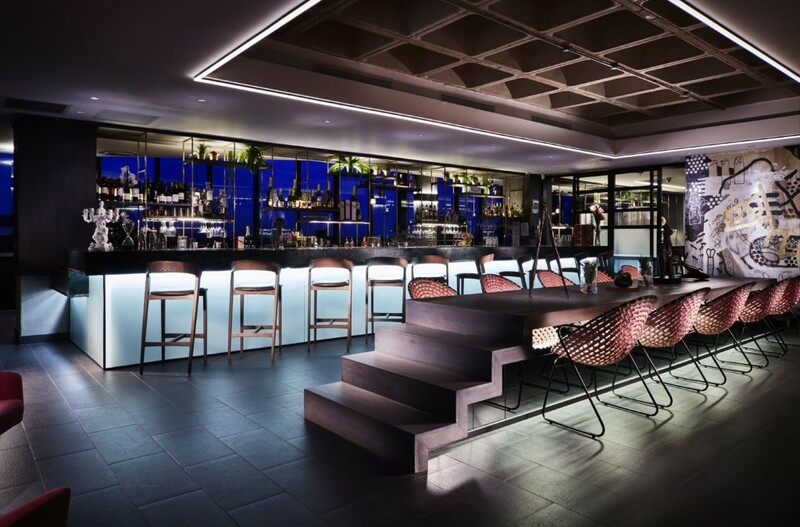 Tucked into the Trumpet building on Keyes Art Mile Mesh Club in Rosebank is an uber-stylish and exclusive member’s work space for budding and established entrepreneurs. From 4pm play replaces work and the Mesh Club bar, which is filled with bold contemporary artworks and endowed with a great sunset view, opens for cocktails. Each month brings with it a new signature cocktail, inspired by the artworks on display. At the other end of the spectrum is The Tennis Club, a member’s club and bar founded in 2016 on the site of the old Ellis Park Tennis Stadium. Casual and bohemian this no-frills kind of spot appeals to the city’s creative set of artists, designers and musicians with DJ parties twice a month. You couldn’t wish for a better tour guide to the tastes of the African melting pot that is Yeoville than Sanza Sandile. A former radio journalist he is something of a local legend as much for his stories and unique insights as for his cooking. Even global food celebrity Anthony Bourdain tracked him down for his local knowledge and cooking expertise. 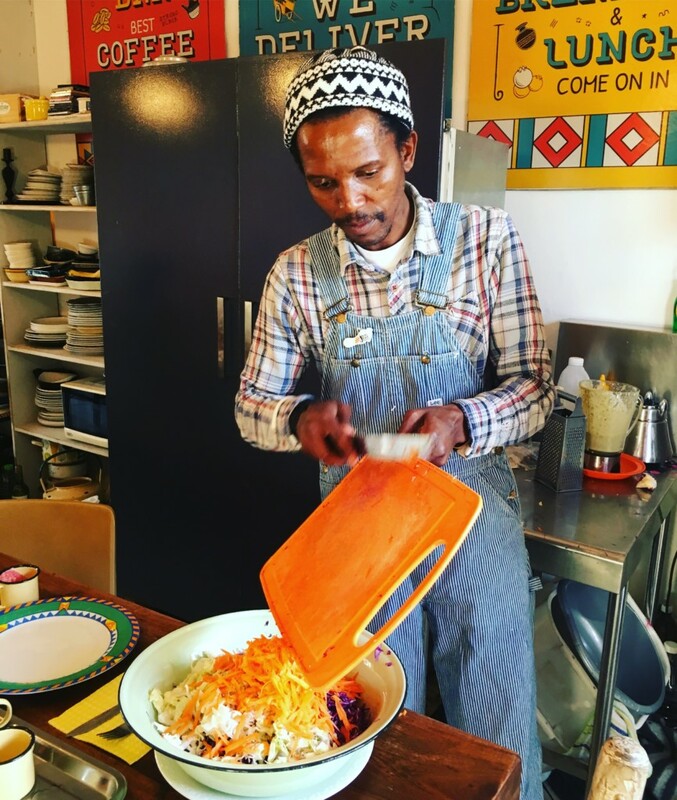 At his Yeoville dinner club at a rooftop location along the suburb’s bustling main thoroughfare, Rockey Street, he serves up a ‘Pan Afrikan Plate’ long table dinner with ingredients that have been sourced from the neighbourhood market and kitchens. From Mozambican-style fried fish to Nigerian-inspired Jollof rice and Middle-Eastern falafel and dips, the table is a feast for the eyes and the stomach. You’ll share it with a cosmopolitan crowd of locals and visitors and if you are in luck, the Japanese DJ might be spinning the decks at the smoking reggae club next door, making for an even more unforgettable night. Chez Fong is a weekly bookings-only pop-up restaurant on the covered patio of a Upper Houghton mansion, overseen by the vivacious Su-Yen Thornhill of Scottish-Chinese extraction. Expect a fun night out with a multi-course (between eight and 10) Asian-influenced tasting menu. The menu changes weekly and everything you will taste is home-made including the excellent hoisin sauce that you will want to pour over every morsel. Thornhill’s dishes are beautifully plated and each dish is to be relished. Menu standouts when we visited were the chicken and egg drop sweetcorn soup, shitake and shimeji mushrooms with lotus root greens and sesame-crusted seared tuna with daikon radish and pickled ginger. ABSA Money Museum Barclays Tower West, 15 Troye St, City Centre, tel. +27 11 350 3003. Open 08:30–16:00. Closed Sat, Sun. Admission free. Note that you must show a photo ID to enter the building . Ferreira Mine Stope Standard Bank, 5 Simmonds St, City Centre, Open 08:00–16:00, Sat 08:00–13:00. Closed Sun. Admission free. The Faircity Mapungubwe Hotel 50 Marshall St, Marshalltown, tel. +27 11 429 2600, mapungubwehotel.co.za. Sin & Taxes Park Corner, 2 Bolton Rd, Rosebank. Open 17:00–01:00. Closed Sun, Mon. Mesh Club Trumpet, 21 Keyes Ave, Rosebank, meshclub.co.za, tel. +27 10 594 5545. Open to the public from 16:00–23:00. 22:00. Cost R500 per person. Bring your own drinks. Yeoville Dinner Club tel. +27 83 447 4235, see Yeoville Dinner Club on Facebook. Cost R400 per person.